The 1909 Wurlitzer Monster Military Band Organ was included in the purchase of PTC #6 by Kit Carson County from Elitch Gardens Amusement Park in 1928. Records from the Philadelphia Toboggan Company indicate that Elitches kept the original band organ that was purchased by the park in 1905 when it bought the carousel from PTC. It is speculated that the band organ that Elitches sold Kit Carson County came from their roller-skating pavilion or dance pavilion. The band organ under proud new ownership churned out its music at the fairgrounds in Burlington for only two years, before the fair was canceled due to The Great Depression. The Wurlitzer fell into disrepair and it did not accompany the carousel riders again until after it was restored in 1976. The band organ, with regular mainternace and care, played throughout each carousel operating season between 1976 and 2018. However, shortly after the 2018 Kit Carson County Fair, one of the band organ’s crank shafts broke…immediately silencing it. The organ has two crankshafts, one on the left side of the cabinet for the pressure pump and a smaller one on the right side for the vacuum pump. Each crankshaft has two wooden connecting rods that pump the pressure and vacuum bellows, respectively. In early August the bottom end of one pressure pump connecting rod came loose from the bellows and jammed which stalled the crankshaft. The motor kept turning the large drive pulley which fortunately came loose from the crankshaft instead of breaking it. 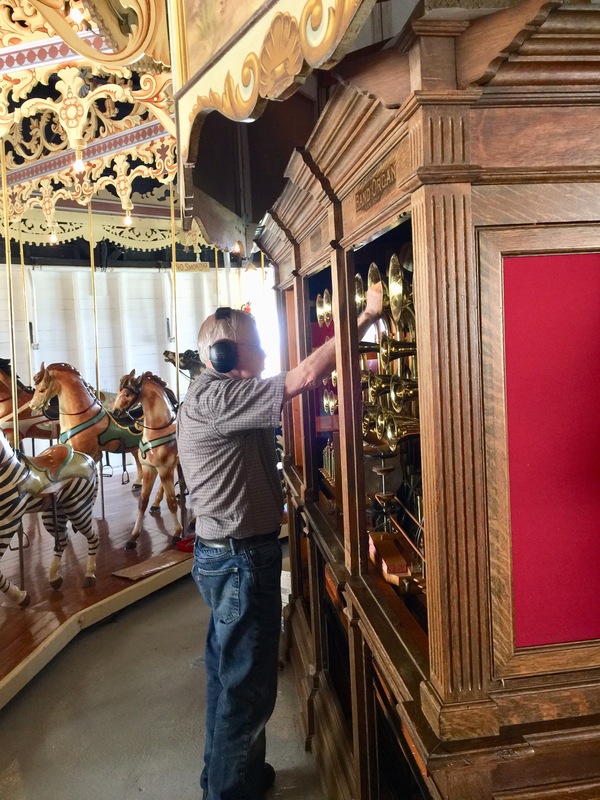 As needed repairs would be lengthy, the carousel riders were accompanied by recorded band organ music for the remainder of the season. This was reminiscent of the many years when PTC #6 riders took their spins on their favorite animals singing along with music played on a record player.